A new report, published by the Food and Agriculture Organization (FAO) of the United Nations (UN) has made a startling revelation: During the first half of this decade, India’s undernourished population, in absolute terms, increased from 189.9 million in 2010-12 to 194.6 in 2014-16. Released to mark the World Food Day, which fell on October 16, the report is titled “The State of Food Insecurity in the World”. 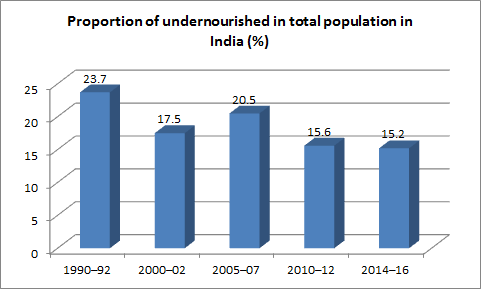 While India can console itself that, in percentage terms, the undernourished population in the country went slightly down during the period in question (between 2010-12 and 2014-16) from 15.6 to 15.2 per cent, there is reason to worry. China, which is the other most populous country in the world having a big undernourished population, experienced a higher fall in the percentage of undernourished from 11.7 to 9.3. In fact, in absolute terms, too, China’s undernourished population went down from 163.2 million to 133.8 million between 2010-12 and 2014-16. Of course, there is a consolation: Pakistan’s undernourished population went up from 38.3 million to 41.4 million during this period. It simultaneously registered a rise the percentage of the undernourished – from 21.8 per cent in 2010-12 to 22.0 2014-16. 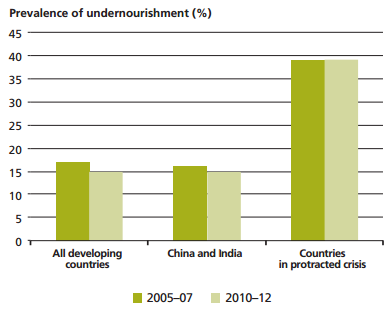 On the other hand, however, Bangladesh witnessed fall in absolute number of undernourished during the period from 26.5 million to 26.3 million during the period, with the percentage of undernourished falling from 17.3 to 16.4 during the period. 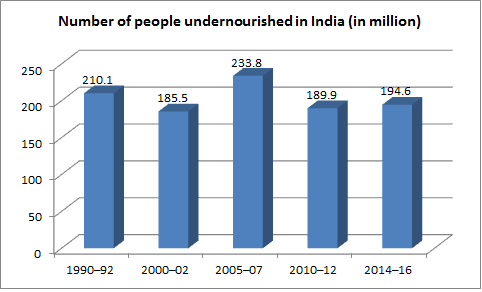 Overall, India witnessed a 36 per cent fall in the undernourished population since 1990-92, as against China’s 60.9 per cent, Bangladesh’s 49.9 per cent, and Pakistan’s just 12.4 per cent.